The Home Health ICD-10-CM Coding Answers, 2019 is the perfect tool to use along with the Complete Home Health ICD-10-CM Diagnosis Coding Manual, 2019. When purchased separately, you pay $398, but when you order these two products together, you pay only $299, a savings of nearly $100! 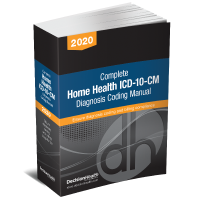 DecisionHealth’s Complete Home Health ICD-10-CM Diagnosis Coding Manual, 2019 is the only ICD-10 manual created specifically for home health coders and contains guidance, illustrations, tips and scenarios to help you accurately code your home health claims. 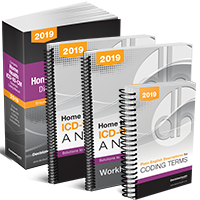 Home Health ICD-10-CM Coding Answers, 2019 is the perfect educational resource to use in conjunction with your 2019 Complete Home Health ICD-10-CM Diagnosis Coding Manual. Packed with coding scenarios and their rationale, plus a BONUS plain-English guide of coding terms, this is the ideal resource to practice ICD-10 coding, increase accuracy and simplify coding. Work through 200 scenarios that cover home health’s most complicated situations, including surgical and trauma wounds, late effects, neoplasms and much more! Make sure your coders have the perfect pair of resources to guide them towards accurate ICD-10 code selection: the Home Health ICD-10-CM Diagnosis Coding Manual & Answers, 2019. 30-Day Money-Back Guarantee: If you do not find that these products improve your coding accuracy, return your purchase within 30 days from receipt for a full refund; no questions asked.